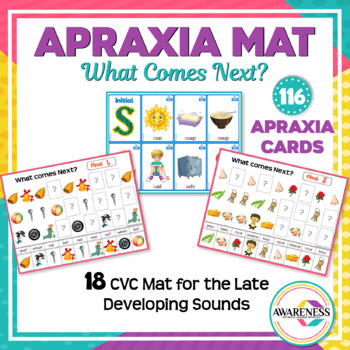 Apraxia Mat. What comes next?/ Follow the pattern targets CVC words for the Late Developing Sounds. Though this packet is designed to be used for Childhood Apraxia of Speech (CAS), it can also be perfect for Articulation Disorders and Phonological process; Initial Consonant Deletion [ICD] and Final Consonant Deletion [FCD]. 1. Page 4-Page 21: A No-Prep just Print and Go Version : 18 Mat for the Late Developing Sounds;Initial and Final positions for [l-r-s-ch-sh-v-j-z-th]. 2. Page 23-Page 40: 116 Cards for CVC words used in all the Mats. 7 Cards for most sound position except (4 cards only for Initial Z, Th and Final J) and (6 cards only for initial V). 18 Cover Cards for each Sound position for easy sorting and storage. 3. Pages (42-64): I made another version (Same pages) if you decided to invest some time to make an Interactive book that can be used repeatedly. ✅ Be sure to follow my store to be alerted of new products ➪ click here. ✅ Don't forget to leave feedback. You will receive TPT credits that can be used on future purchases!